We know that military occupation, ethnic cleansing, racism, and colonialism are incompatible with queer liberation and with fundamental human rights. We are EXTREMELY DISAPPOINTED that the National LGBTQ Task Force has chosen to welcome back the reception hosted by the organization “A Wider Bridge” on “LGBT Life in Israel”. 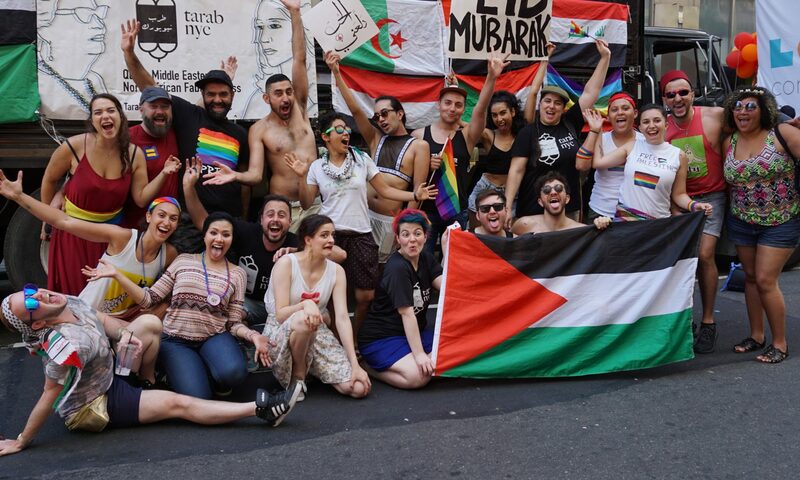 The reversal in cancellation demonstrates a true lack of commitment to opposing military occupation, ethnic cleansing racism, and colonialism–all of which we view as fundamentally incompatible with queer liberation! A Wider Bridge partners with the Israeli Consulate and the right wing Israel advocacy organization Stand With Us to put on pinkwashing events that are boycotted and protested by queer and trans activists across the United States. We understand this reception to be part of a broader Zionist political strategy to “pinkwash” Israel’s complicity in violating Palestinian human rights. We condemn any efforts to discuss “LGBT Life in Israel” that cultivates pinkwashing propaganda and does not center the decolonization of Palestine. After bold advocacy by migrant justice activists and organizations, Creating Change pulled ICE off the program and apologized for offering space to a force of brutal violence in queer and trans lives. Immigration enforcement should not be pinkwashed at Creating Change, and neither should Israeli occupation, apartheid and ethnic cleansing. The Creating Change conference re-cancel the reception, and release a public statement attesting to why the reception hosted by A Wider Bridge should be cancelled (specifically, as a move to counter pinkwashing and Zionist efforts in solidarity with the Palestinian people). The Creating Change conference commit to opposing future efforts that promote Zionism and pinkwashing of the illegal occupation of Palestine–whether those efforts appear in workshops, caucuses, plenaries, organizational sponsorships, and more. The National LGBTQ Task Force publicly endorse the Palestinian right of return and the boycott, divestment, and sanctions (BDS) movement. Opposing racism, colonialism and ethnic cleansing is central to queer and trans liberation. Just as we cannot make space for ICE to be promoted at Creating Change, we must oppose Creating Change being a platform for Israel advocacy organizations that seek to cover up the brutality of the occupation. We call upon all who are committed to justice and in solidarity with Palestinian people to join us in demanding accountability from the Task Force and a clear message that Creating Change is not a space for pinkwashing. Adalah-NY: The New York Campaign for the Boycott of Israel. Recent events — the Charlie Hebdo killings in Paris, the arrest of a 13-year-old Muslim for bringing a clock to school, the ongoing wars in Syria, Iraq, and Yemen, and the resulting refugee crises — prompt us to consider how Western biases and perceptions of the MENA region affect conflict, shape foreign policy, and operate in individual client work (legal, activist, etc.). The United States and Europe have recently intensified their complicity in oppressing the MENA region; we bear frequent witness to the corresponding prejudice against Muslims and diasporic MENA individuals. Queer activists must therefore pay close attention to the heteronormative, patriarchal language and imagery used by the West to frame its “Other”. Imperialism, racism, exotification and eroticization affect all interactions of Western human rights activists, NGOs, and lawyers with MENA people. Join us as we explore these issues from a queer and human rights perspective. That’s why we’re disappointed that the National LGBTQ Task Force allowed the organization “A Wider Bridge” to host a reception on “LGBT Life in Israel” at the Creating Change conference. The Task Force has since cancelled the event thanks to the advocacy of solidarity activists. A Wider Bridge partners with the Israeli Consulate and the right wing Israel advocacy organization Stand With Us to put on pinkwashing events that are boycotted and protested by queer and trans activists across the United States. We understand this (now cancelled) reception to be part of a broader Zionist political strategy to “pinkwash” Israel’s complicity in violating Palestinian human rights. The Creating Change conference release a public statement attesting to why the reception hosted by A Wider Bridge was cancelled (specifically, as a move to counter pinkwashing and Zionist efforts in solidarity with the Palestinian people).